Last year’s Equifax data breach was a seismic event: Tens of millions of Americans had their personal information — from Social Security numbers to home addresses — pilfered by hackers, exposing them to fraud and identity theft. Equifax customers in other countries, like the UK and Canada, were also affected. Then, earlier this month, we learned the breach may have been worse than expected, with Americans’ tax IDs and driver’s license numbers swept up in the hack, too. This bad news broke just days after an astonishing development: The CFPB is not pursuing an investigation into the 2017 breach. While the previous CFPB director had ordered a full investigation, the new head, Mick Mulvaney, hasn’t taken any steps forward, like ordering subpoenas for Equifax executives. Earlier this month, Mozilla launched a petition urging Mulvaney to move forward with the investigation. 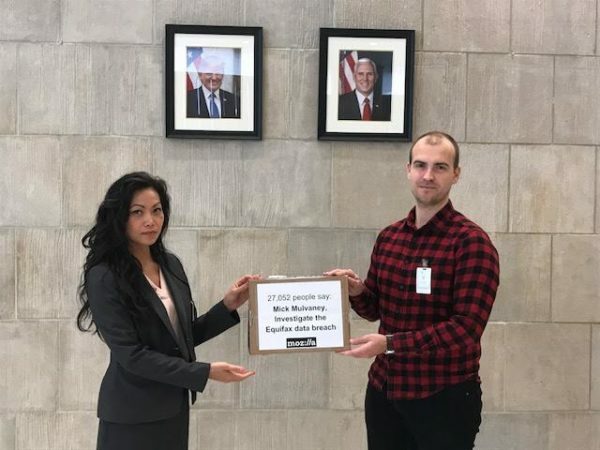 Today, the CFPB accepted our petition, and Mozilla delivered all 27,052 signatures to the bureau’s headquarters in downtown D.C. What’s next: Mozilla will await a potential response from the bureau.